I love a good sandwich. All kinds. But I get into certain “sandwich moods”. In other words, the kind of sandwich that I crave changes. Sometimes a cold bologna sandwich with mustard is on my mind, sometimes it’s a big honkin turkey sandwich loaded with arugula, and sometimes just a plain old PB & J will do. When a grilled cheese sandwich is on my mind, so is the ooze. Listen, between my undergrad and my graduate classes in nutrition, I have had my fair share of chemistry and food science classes. I can very easily espouse the science behind the milk proteins and what happens to them when cheese is heated. How the molecules react. The maillard reaction occurring when the bread browns. What kind of writer would I be, however, if my prose simply lulled you to sleep? No, I don’t want to discuss the chemical reactions of grilled cheese sandwiches. That’s ho hum…dare I say boring. (My humble apologies to my chemist friends. I love you! I really do!). It’s the ooze that makes me crave a creamy grilled cheese. In the interest of science I have conducted some research on the appeal of melting cheese, the allure of crisp browning bread, the draw of a warm rich scent wafting through the kitchen. Well, not exactly research. But I talked to a lot of my friends about it at my son’s end of season basketball party. Then to some folks at work. And like me, people are very opinionated about grilled cheese sandwiches. 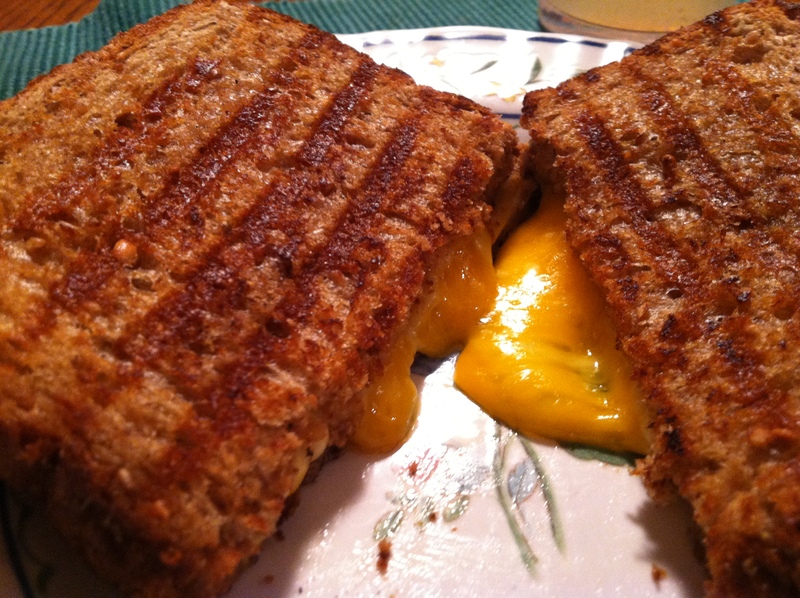 Everyone seems to have preferences about what kind of cheese must go onto a grilled cheese sandwich. 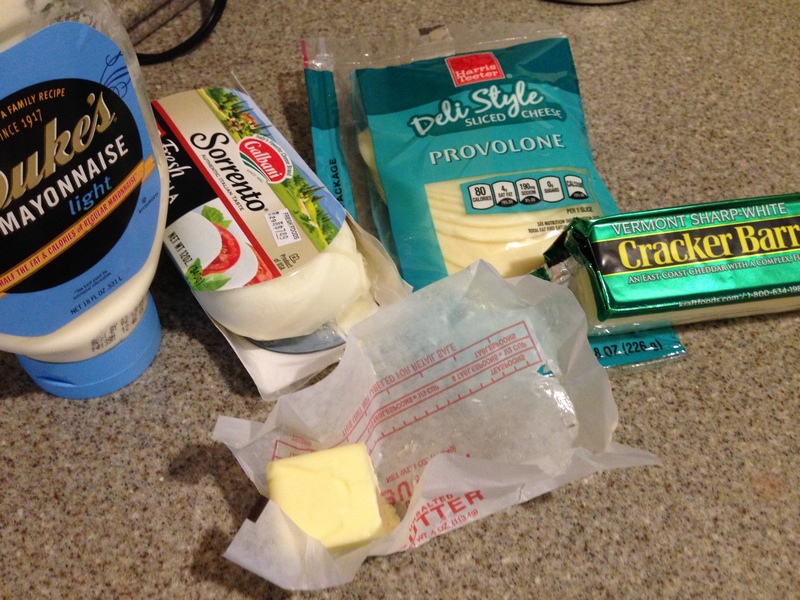 Swiss, cheddar, gouda, mozzarella, and american cheese were all thrown out there. I heard differing opinions on the virtue of shredded cheese versus sliced too. Most folks seemed to prefer at least 2 different types of cheese on their sandwich. The type of bread used is also a critical component here, as it is with any sandwich. So much to consider! And, of course, we must discuss how to cut the sandwich after it’s done. There are 2 methods-corner to corner or straight in half down the middle. I personally happen to be a right down the middle person, not corner to corner. But that’s just me. There are indisputable qualities that contribute to the true success of every grilled cheese sandwich. Grill marks. Perfect browning. And, of course, the cheese must be fully melted. Creamy. Stringy. Look at that creamy oozing cheese! Yum! And those grill marks! Yes!